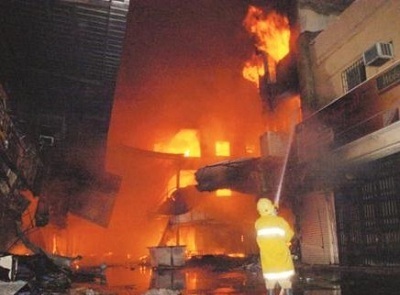 Muslims in the area of el-Amerya, with the complicity of police and state authorities, set fire to Christian homes and shops, and forced several families to leave the country, under the threat of further violence. Cairo (AsiaNews / Agencies) - The radical Muslims are trying to empty a village near Alexandria of its Coptic population - 62 families, on the basis of unfounded allegations against a Copt. The Copts of Kobry-el-Sharbat (el-Amerya) were attacked on Jan. 27 by a crowd of some three thousand Muslims led by Salafi leaders who set fire to the Copts houses and shops. The violence were sparked by the allegations of a barber Muslim Toemah, who claimed that a Coptic tailor of 34, Samy Mourad Guirgis, had "illegal" photos of a Muslim woman on his cell phone. Mourad has denied the charges, and turned himself in to police in fear of his life. The Muslims set fire to his house and his shop, and his whole family was forced to leave the village. Mourad is still under police custody. Since then there have been three "reconciliation meetings" in the police headquarters in el-Amerya, attended by representatives of the Coptic Church, the Salafis and the Muslim Brotherhood. According to police, the woman concerned has denied the whole story, and no compromising photos of any kind were found Mourad’s cell phone. But radical Muslims argue that "Muslim honor has been damaged," and at the first meeting, they refused any type of compensation for the Copts who were innocent victims of their violence. On 30 January a crowd of Muslims attacked the village of Kobry- el-Sharbat for the second time, setting fire to three Christian homes, under the eyes of the security forces. Following this Islamic representatives have requested that a wealthy Coptic merchant, Soliman, be expelled from the village, accusing him and his sons of having fired into the air while their house was being burned. The family of the merchant denies that there were gunshots, and no one was injured. The police, however, has issued an arrest warrant for Soliman’s sons. On 1st February in a "reconciliation meeting" demands were made for a number of Coptic families to be expelled from the village and the forced sale of Soliman’s assets, under the supervision of the Salafist Sheikh Sherif el-Hawary. Otherwise Kobry el-Sharbat would be attacked again, and the Coptic houses completely burned. Soliman signed the agreement, defined by father Boktor, who was present at the time, "a complete injustice." Soliman agreed only to avoid further damage to the Copts. Magdy Khalil, head of Middle East Freedom Forum, said that "reconciliation meetings" were totally illegal, and that the complicity of Egyptian authorities is obvious and urged Copts to return to their homes. "If we accept this, we will open the door to an avalanche of forced evictions." And forced deportation is a crime under international law.